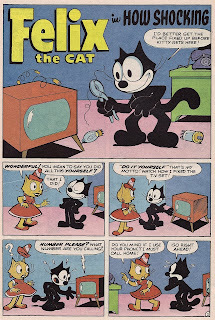 Felix the Cat, the wide-eyed black feline who was the star of the silent cartoon era of the 1920s was first featured in 1919's Feline Follies produced by Pat Sullivan Studios. 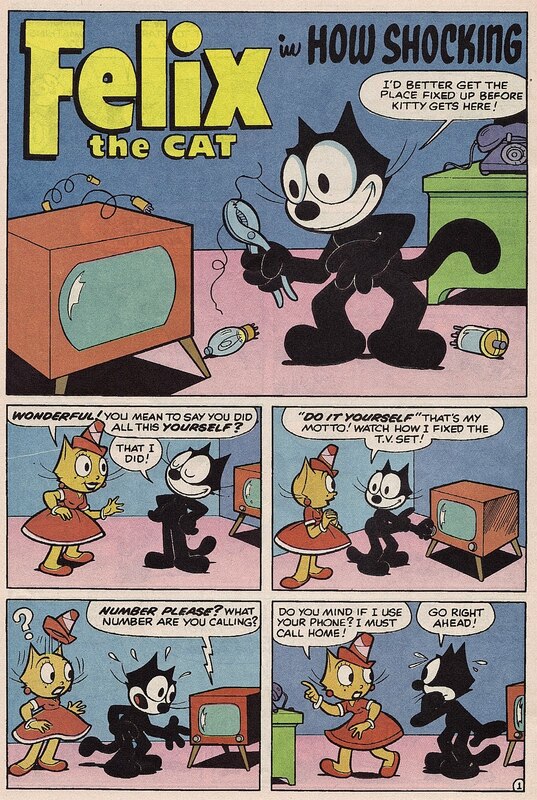 While "Master Tom" was a prototype for Felix, everything that is unique to Felix is presented in Feline Follies. 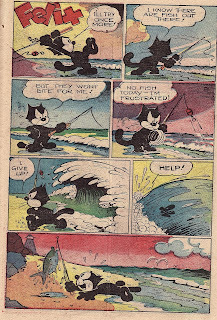 Feline Follies proved to be popular so "Master Tom" was showcased in the the next cartoon, The Musical Mews (1919) and was given his moniker Felix in the third cartoon The Adventures of Felix the Cat (1919). 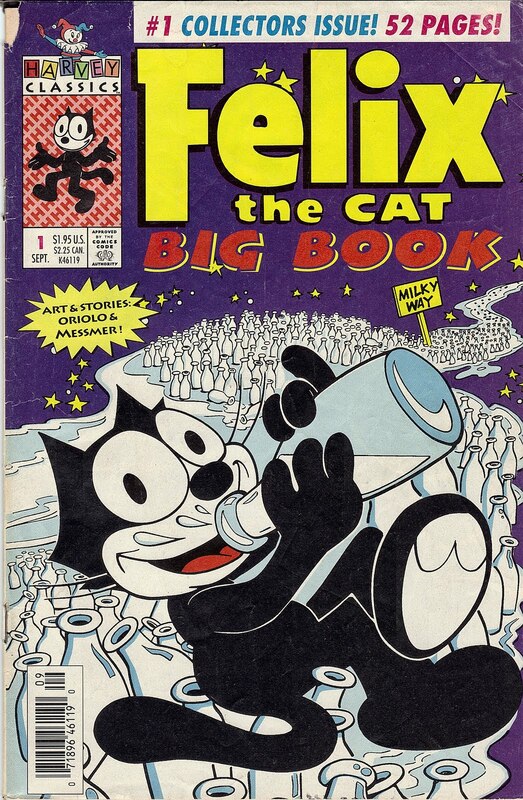 There are three versions about how the name "Felix" came about but the most common is that the name comes from the Latin words for cat (felis) and luck (felix). What remains in constant dispute is who created Felix. Pat Sullivan immigrated to the United States in 1914 and became a noted animation producer, creating cartoon featuring Charlie Chaplin as his Tramp character. 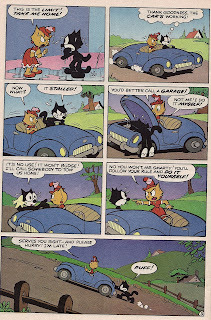 These cartoons would actually feature some of the same animation and visual gags used the future Felix cartoons. Sullivan always stated while he was alive that he created Felix and created a cartoon in 1917 called The Tail of Thomas Cat which features a non-anthropomorphic cat. 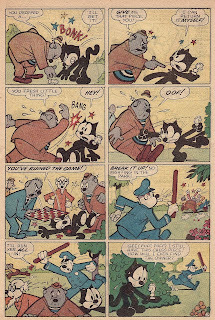 Sullivan proved to be Felix's downfall in the late 1920s when most cartoons were moving to sound, Sullivan refused to convert Felix and the last silent Felix cartoon premiered in 1930 and was considered a flop. In March of 1932, Sullivan's wife fell out of a seven story window to her death and Sullivan, who had always been a drinker, lapsed into acute alcoholism and died of pneumonia in February of 1933. 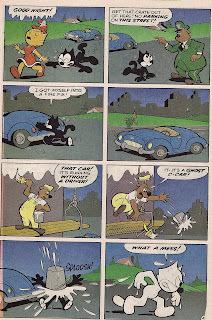 Otto Messmer was the lead animator for Pat Sullivan Studios and many people credit him with creating Felix the Cat because, well, it was well known that the animators actually did most of the creating (Ub Iwerks actually created Mickey Mouse, for example). 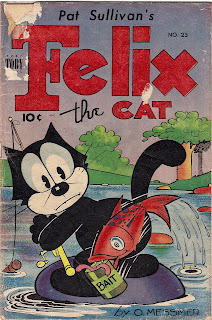 Messmer continued working on Felix long after Sullivan had died and worked on the comic strips and comic books and with Joe Oriolo, who created the popular 1950s television series. 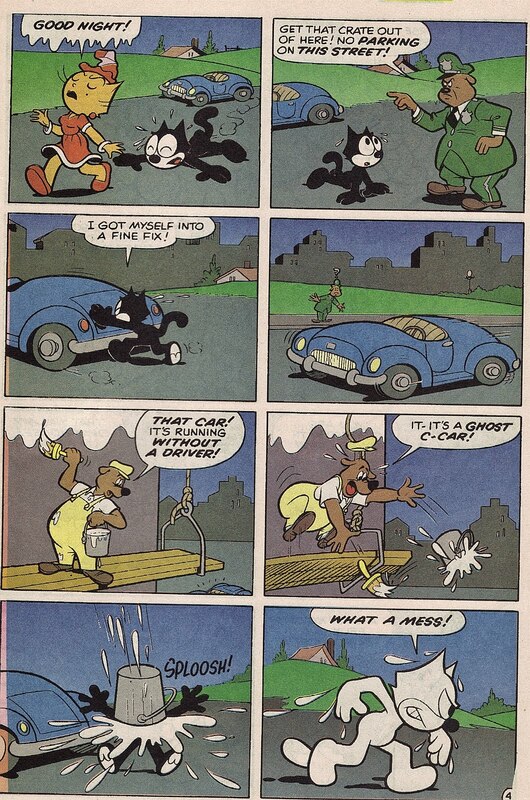 Oriolo, who was once one of Messmer's assistants and the creator of Casper, the Friendly Ghost, made sure that Messmer was given credit as the creator of Felix. 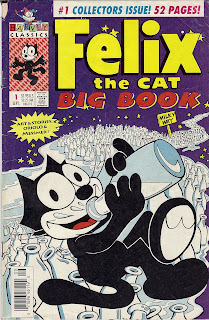 Messmer continued working on Felix until his death in 1983. 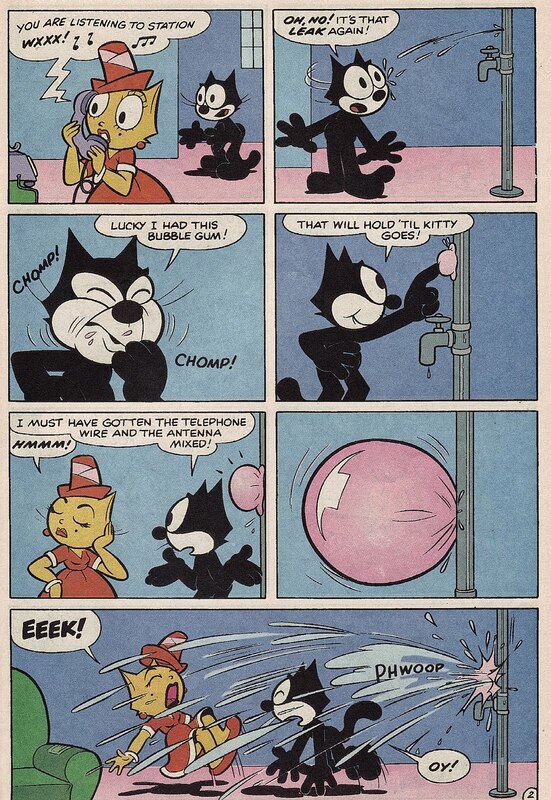 The Felix the Cat comic strip started in 1923, which was the year Felix reached the peak of his popularity, but was either re-inked strips from a newspaper in England or re-inked animation drawings stuck together to create a story. In 1931, Messmer took over writing and drawing details and the comic strip became original. The comic strip continued until 1967 although Messmer would leave it in 1955. 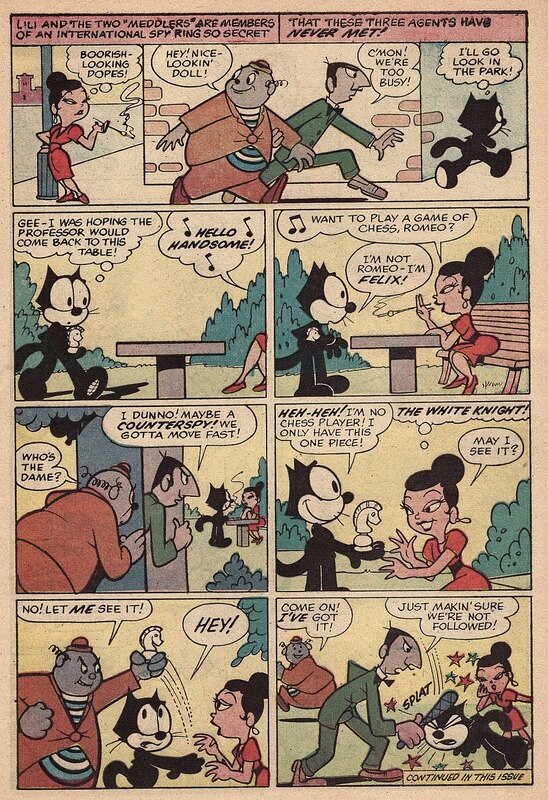 Felix would return to the comic strip world in 1987 in Betty Boop and Felix but in 1988, Felix would be taken out of the strip. 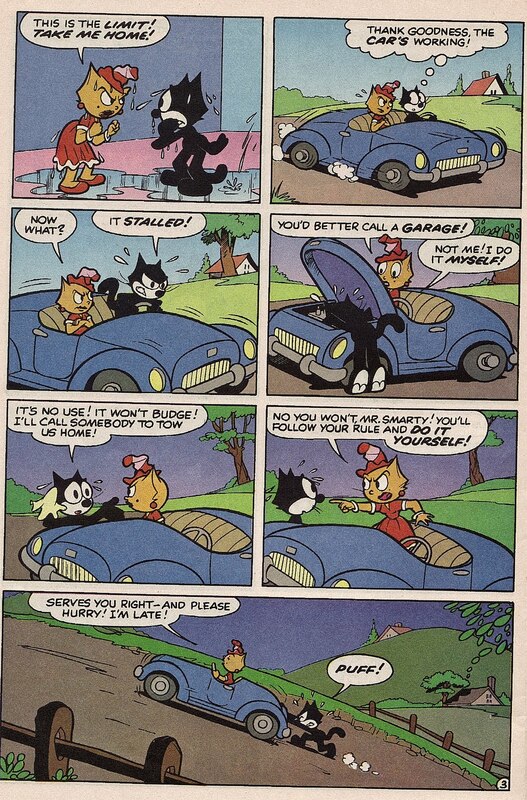 Betty Boop and Friends would be canceled in 1990. 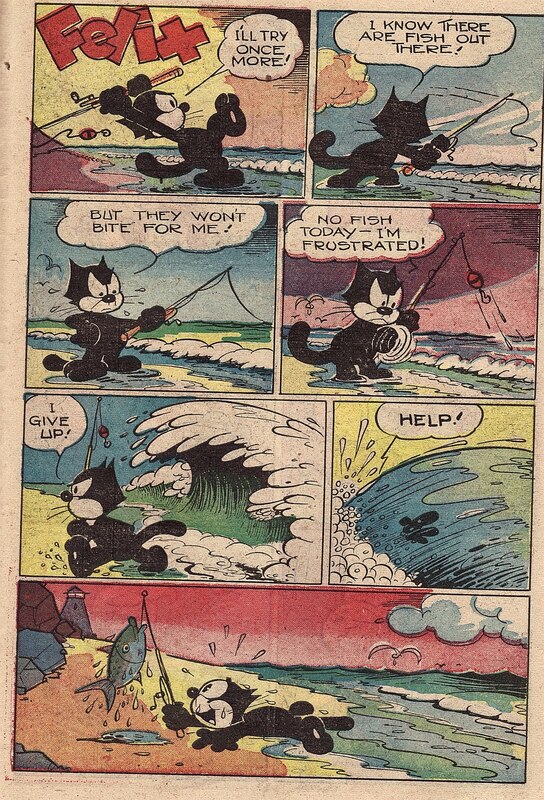 Here are a few Felix the Cat comic strips from the 1920s and 1930s. 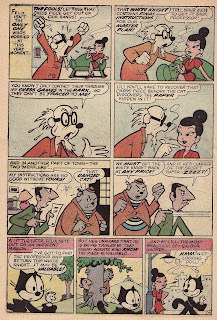 The strip was distributed by King Features Syndicate and are displayed at goldenagecartoons.com. From 1924. 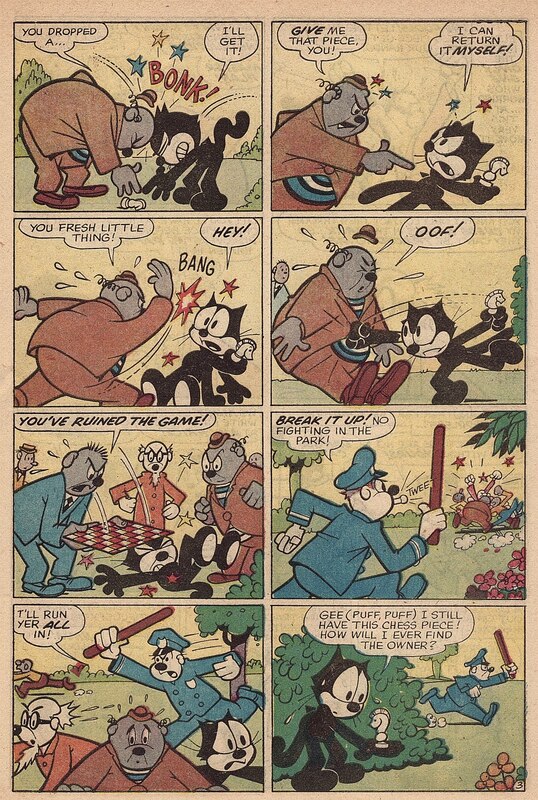 Felix attempts to get a job catching mice but is instead horribly abused and yelled at. What I find interesting is that Felix is apparently just going around to random houses and asking for work as a normal cat. From 1925. Felix gives poor children a Christmas miracle. From 1931. Felix eats too many hot dogs which results in an acid trip. From 1931. Felix endangers a man's life in order to build a plane and win $60,000. Everyone should know the Felix the Cat television series that aired on Saturday mornings from 1958 to 1961 but Felix was also a television star from the very beginning. 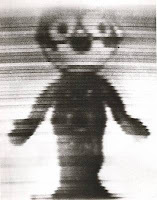 A wooden image of Felix was used in 1931 by NBC to test picture quality from New York all the way to Los Angeles in the very early days of television. 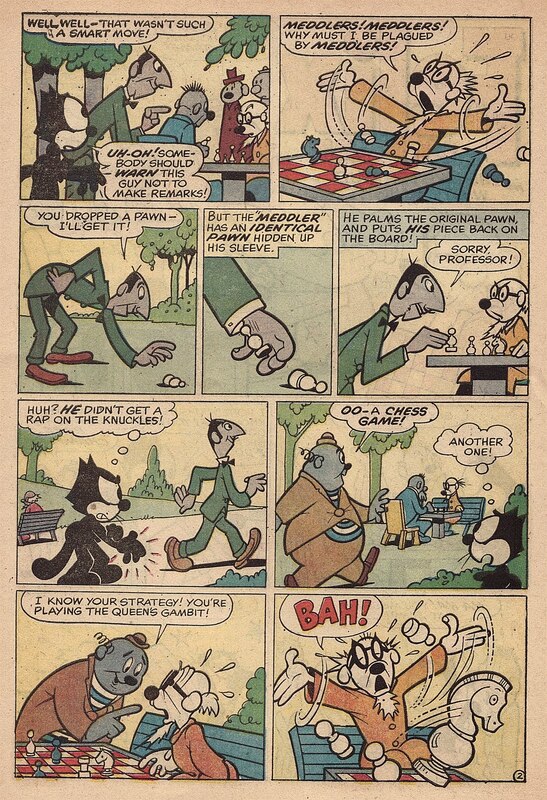 Felix was placed on a turntable that spun around but, due to falling off the turntable one too many times, the Felix statue was retired and replaced with a statue of Mickey Mouse. Felix would go on to star in a theatrical film in 1988 but the movie would not be released in the United States until 1991. The film was premiered in Los Angeles in 1989 but would never been shown in theaters. It came out on VHS in 1991 and has not seen an official DVD release in America yet. The movie, while not really noteworthy, was one of the first movies to use computer animation. 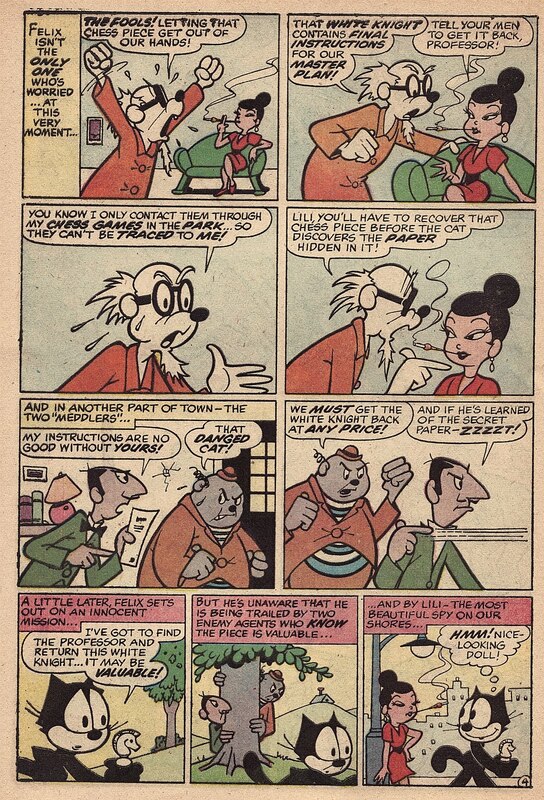 The following are a few stories from the comic books. 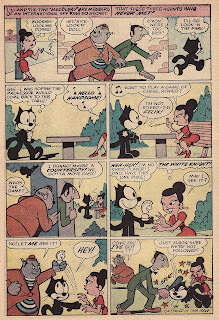 Felix the Cat #23 (Sept. 1951) Toby Press, Inc.
All characters owned by Felix Comics, Inc. (C)1951. All characters owned by Felix Comics, Inc. 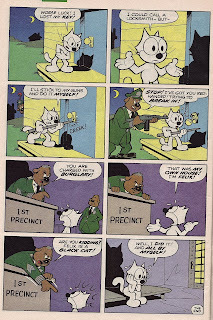 Published by Harvey Comics (C)1957. Don't worry, Felix gets out of this predicament (as he always does). 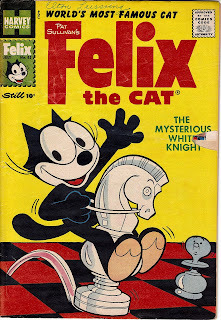 Felix gets trapped in a suit of armor and is forced to steal gold bricks from Fort Knox. He ends up using a blowtorch to heat the gold bars thus burning the criminals hands and causing the Fort Knox guards to arrest them all--except Felix. 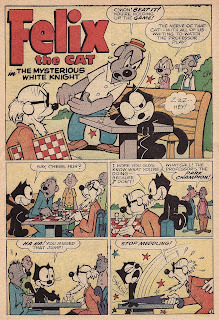 All characters owned by Felix Comics, Inc.; Published by Harvey Comics. (C)1992.